Kelpie, Sloop, 6 tons. Sir William B. Forwood. Was born in 1840, and educated at Liverpool College. For many years he was a leader among Mersey yachtsmen, and an expert canoeist. In 1872 he was elected President of the Northern Branch of the Royal Canoe Club, and a year later Vice-Chairman of the Cheshire Yacht Club. He was Rear-Com­modore of the Royal Mersey Yacht Club, and is Commodore of the Royal Windermere Club, a position which he had previously occupied several times. He was one of the first yachtsmen to pass the Board of Trade examination. He was a leader in the movement which ended in the foundation of the Yacht Racing Association, and was for years an active member of the Council. In 1886 he was elected Chairman of the Committee appointed to consider the alteration to the rating formula, and at all times he has laboured to stimulate an interest in yacht-racing and the develop­ment of a healthy type of boat. He owned his first boat, the American sloop Truant, in 1861. This boat he followed with Glance and Satanella, and in 1874 he commissioned Ratsey of Cowes to build the 20-tonner racing cutter Playmate. 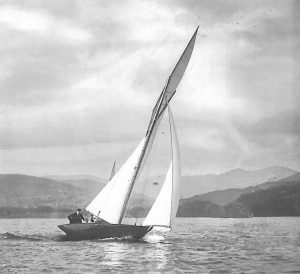 In 1882 Inman built for him the 50-ton yawl Leander, designed by Alexander Richardson. It was not only on the Mersey that Sir William enjoyed popu­larity as a yachtsman. For thirty-eight years he has never missed a regatta on Lake Winder­mere, a sheet of water to which he has been particularly devoted. He has owned a small fleet of yachts, and in 1870, when racing Spray, he won every prize offered. He now owns the s.y. Banshee and the yachts Breeze, Kelpie, and Ripple. Clubs: Royal Mersey, Royal Windermere.